I hope this note finds you well. As I write to you this week, I am preparing to board a flight back to the United States at the conclusion of our Wesley Heritage Tour of England. I know I speak for the entire group of pilgrims from Peachtree Road when I write that this has been a spiritually enriching trip. We have been blessed. At the close of this note, I will offer my “Top 5 List” of best things that we experienced in the last week. First, I wanted to let you know about the death of one of our finest members – Bill Pritchard. Bill was a long-time member of Peachtree Road who served as the chair of the Administrative Board exactly 50 years ago. He was a member of the Timothy Sunday School class, a member of several Bible study groups in the church, a strong advocate for outreach to those in need, and a regular lay visitor to members of our church who were in the hospital. I particularly will miss Bill’s enthusiastic support and encouragement. His funeral will be next Wednesday, August 8, at 11:00 a.m. here at the church. Please remember his family and dear friends in your prayers. Second, I hope you are making your plans to be in worship this Sunday. We are kicking off a new sermon series entitled “Faith Questions.” Our lives are filled with “big questions” that we need to answer as we move from one stage of life to another. For example, as we move through adolescence, it is important for us to discover who we are and our purpose in life. Our biblical guide for this series will be the Old Testament character David, and we will observe how he answered the big questions in his life (sometimes well…and, at other times, not so well!). Together, we’ll listen for God’s call and discover how to make our lives count at every age and stage. Why Is My Life Full of Valleys? How Can I Make My Life Count? Carolyn Stephens will be preaching in the sanctuary and Julie Schendel will be preaching at The Road service this Sunday. I will be worshiping with you online as Wendie and I spend the weekend away celebrating our 35th wedding anniversary. I hope you will join your friends at Peachtree Road for worship this week as we begin this important series of messages. This Sunday also is Young Adult Sunday at Peachtree Road. We are blessed with a vibrant group of young professionals who actively participate in the ministry of our church. On Sunday we will highlight this ministry and celebrate their leadership in our church. Several young adults will assist in serving the Sacrament of Holy Communion this Sunday. If you are new to the community and have not found your place of connection yet, I encourage you to consider the young adult ministry at Peachtree Road. I am grateful to our associate minister Leslie Watkins for her leadership in coordinating this vital ministry. As we come to the end of summer, I want to remind you that now is the time to sign up for Disciple Bible Study. Many of you already have been a part of Disciple, but there is a new study out that is designed for those with a very busy schedule – Disciple Fast Track. Instead of the marathon run of 34 weeks of study with 2.5 hours each week of class time, the course has been streamlined – 12 weeks studying the Old Testament in the fall and 12 weeks in the spring studying the New Testament. Also, the class time has been shortened to 1.5 hours. If you have not taken Disciple before because of the time commitment, I would suggest you strongly consider Disciple Fast Track. And, even if you have participated in Disciple before, why not take a refresher course beginning this fall. To register, click here. Worshiping at Mow Cop Primitive Methodist Church. Though we outnumbered the members of this small church, they warmly welcomed us, shared their hymnals with us as we sang as John Wesley suggested, and joyfully shared with us the Sacrament of Holy Communion. Then, they invited us to their fellowship hall for English tea and strawberries and cream. It is a memory I will always cherish. 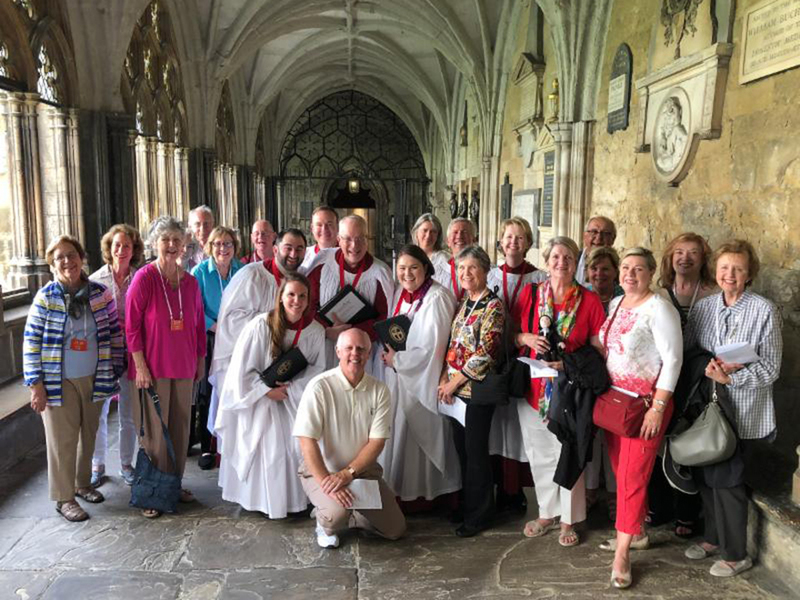 However, without a doubt, the best experience of the week was hearing the Peachtree Road Chancel Choir sing in Westminster Abbey! Week-in and week-out, we are blessed to hear some of the best music in the world. It has been an exciting 10 days traveling with some of the finest people from Peachtree Road. We had a great time, are exhausted, and look forward to getting back home. That’s it for now. I need to run and catch a plane! Thank you for all you are doing through the ministry of this great church. I look forward to seeing you soon. From all of us at Mow Cop Primitive Methodist Church we just wanted to say a big, warm, thank you to all our friends from the United Methodist Church in Atlanta Georgia who came to visit us a few Sunday’s back. Rev. Nick Witham gave a wonderful service, we sang together some rousing songs, with Stan hammering away happily on the piano, and then we all partook of a special moment of communion together, here on the grounds of the first major UK Christian Open Air Camping Meeting- what a wonderfully experience. Afterwards we all headed downstairs into the hall to enjoy some lovely getting to know each other fellowship whilst munching down on strawberries, cream and birthday cake 😋😋😋 We very, very much enjoyed your visit and we are very honored as a church to have made it into the top 5 of your special moments, wow coming in even above tea at Buckingham Palace; maybe I should invite Queeny to afternoon Strawberries and Cream at our little chapel 😉😉 Again, thank you Rev Bill Britt for also making us feel so special by way of honoring our little chapel and our history. It was time spent we shall treasure, and it was great to get to talk American Football.